[This review was originally written by J. Monkman for indiegames.com, and has been reposted here with the editors' permission]. Genuine 8-Bit conversions or remakes of modern indie releases are always fun, but even with the best-known examples of backwards-ported games there are always design sacrifices that have to be made due to the limited target hardware. For this reason an indie game running on a retro platform that actually improves on the original is a real rarity - yet that's arguably what the team behind Ninja Twins: Going to Zedeaks have seemingly achieved with their unofficial ZX Spectrum tribute/clone/sequel of KronBits 2013 freeware puzzler. 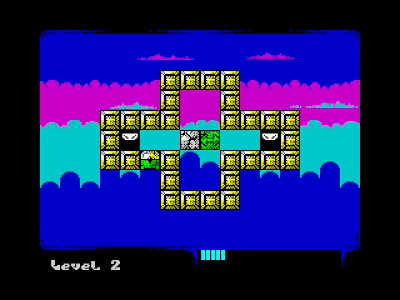 Ninja Twins is a tile-based puzzle game featuring ninjas (unsurprisingly), with the player navigating the two simultaneously-controlled titular twins through 30 challenging single-screen levels in their quest to steal treasure. You only have a limited number of moves at your disposal and there's often only a single solution to each screen - making the wrong move almost always involves a sticky end thanks to the deviously positioned array of spikes and other sharp pointy things. 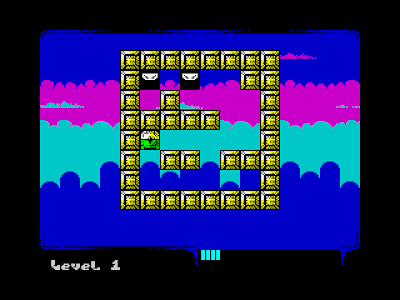 To be perfectly honest, perhaps the single addition of high-contrast colour over the grey-scale original is pushing it in terms of 'improvement', but after playing through the 25 all-new levels on real hardware this cute little game won me over with its charm. 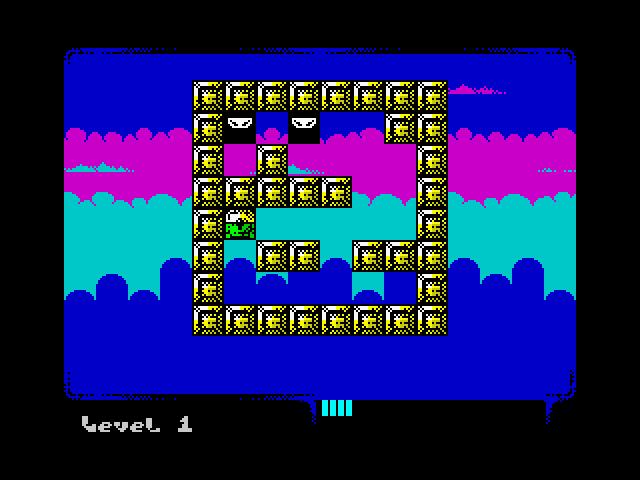 In terms of level design and difficulty the port is pretty much on par with the original, with some allowances made for the smaller play area, and completion of the game even rewards players with a neat little end sequence. 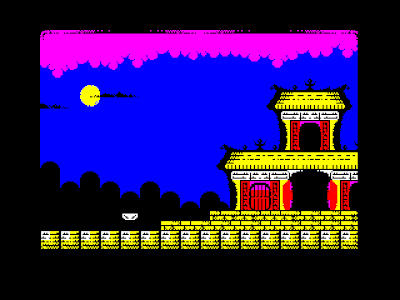 Despite the Spectrum being limited to only two colours per 8x8 pixels, the presentation of the game is fantastic, with a really nice parallax scrolling effect behind the play area and a short lo-fi chip soundtrack that compliments the ninja atmosphere perfectly. Progress is saved via a password system and the keyboard controls are set to the good old QAOP combination that practically every home computer game used in the 1980's (after all, these were the days before cursor keys were standard and WASD would have blown our minds back then). Additional keys include Enter to confirm a selection, 'R' to restart a level (very useful) and 'H' calls up the main menu. 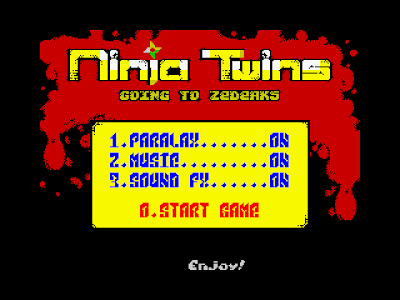 Much like the original game, Ninja Twins: Going to Zedeaks is a great little puzzler - and if you're not afraid to work through an emulator I totally recommend that you give it a go. Oh, and if you have a PC, Mac, Android device or even an Ouya you can grab the official KronBits version from the link below. 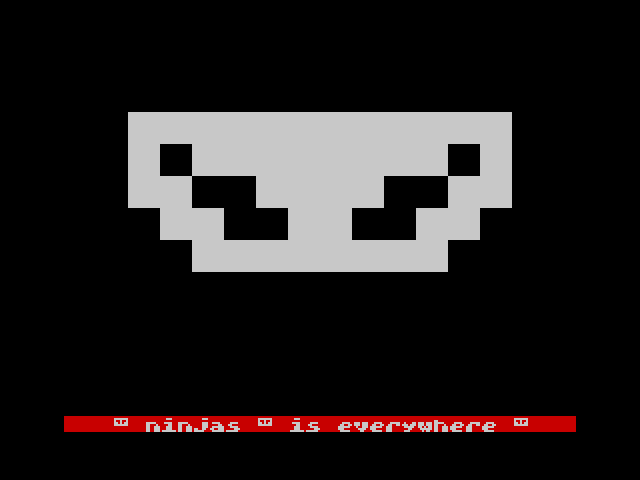 Download the ZX Spectrum port here (from Pouet.net). 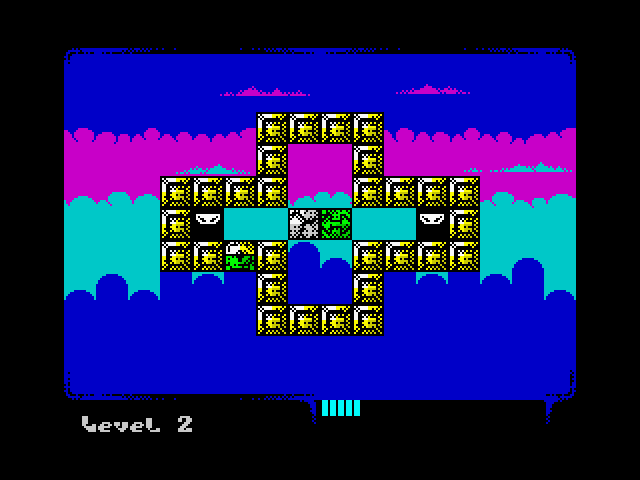 Download the original game here (from KronBits' website). 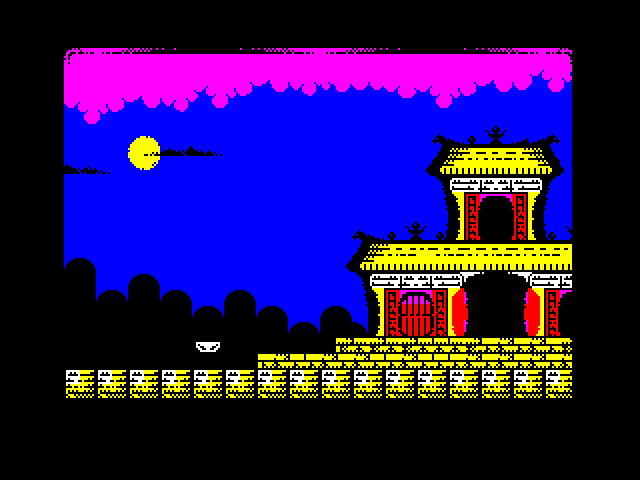 Run it using Spectaculator (shareware) or FUSE (freeware).